Susie Moloney bills herself as a “horrorista” on her Facebook page, but she is much, much more than that. To start with, she’s a great workshop leader. The morning workshop was about backstory. Even if the character’s backstory doesn’t end up as part of the story on the page, the author has to know it in order to create a full character instead of a cardboard cutout. Susie gave us prompts and exercises to use in creating backstory for a character. One of the really fun parts of this and the afternoon’s workshop was hearing the read-around. The variety of characters and circumstances in the room was impressive. The afternoon workshop, “The Six Rules of Writing”, gave us an intensive workout in creating story, using five simple prompts with five to ten minutes of writing time for each prompt. At the end, again, participants who wished to read their work aloud had the opportunity. Of course the stories weren’t polished, but, again, the variety and imagination impressed all of us, and also Susie. The evening featured Susie reading from her work, not only her most recent novel, The Thirteen, but also The Dwelling and part of a short story from an upcoming collection. Susie is an excellent reader and performer, holding her audience spellbound as she read. Alternating with Susie’s readings was great jazz music by the Jeff Holmes Band, a quartet of talented musicians who treated us to classics such as Black Coffee. Oooh, did we mention coffee? Among the door prizes were copies of The Thirteen and The Dwelling along with a pound of Stories in the North’s own Looming Deadline coffee blend, made for us by St Joseph Island Coffee Roasters. 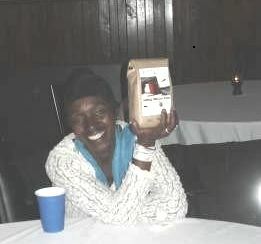 Patricia Wynter with her door prize, our new Stories in the North coffee-blend, Looming Deadline. 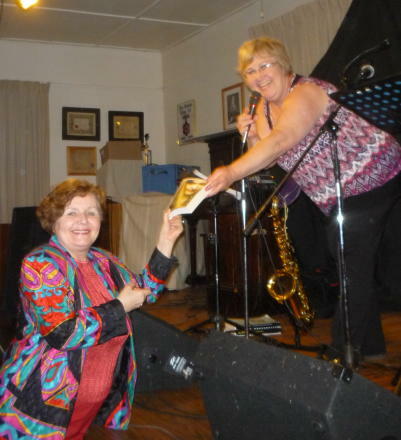 Kathy Gallop receives a copy of The Thirteen thanks to the luck of the draw. 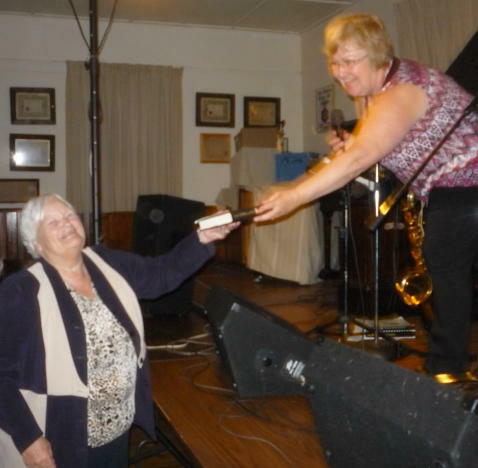 Pauline Clark hands Bernice Walker a copy of The Dwelling. 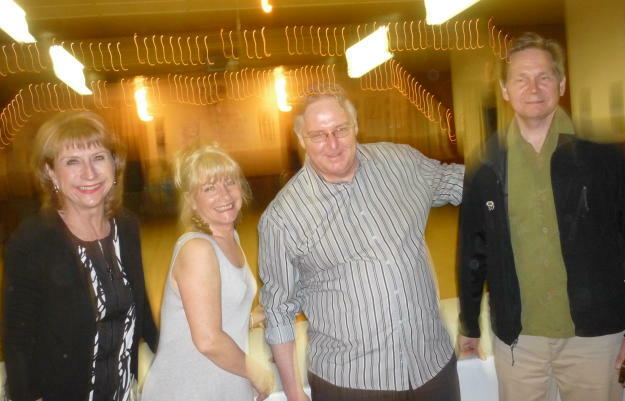 Susie Moloney, looking gorgeous and hanging out with members of the Jeff Holmes Band. Those lights are dancing from the energy level of the evening.